Nufurn banquet chairs : the next generation of banquet chairs customized to your specification. All Nufurn banquet chairs are manufactured to specification. We offer a large range of Nufurn powdercoat colors and fabric finishes. Alternatively, we can customize your banquet chairs in your own fabrics and powdercoat colors as well as design a banquet chair specifically for you. 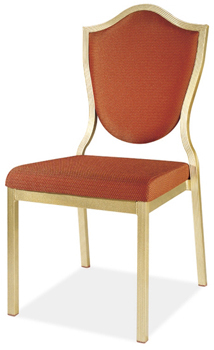 Nufurn banquet chairs are manufactured with either a fully welded steel or next generation alumnium frame. All Nufurn banquet chairs come with our exclusive 12 year commercial warranty. Nufurn are proud to have supplied banquet chairs to a variety of important customers including: Sebel Hotels and Resorts, Crowne Plaza Hotels, Holiday Inn Hotels, Radisson Sydney, Sydney Cricket Ground Trust, Links Seaside, Harbord Diggers Mounties Club, Armidale RSL, Wagga Wagga RSL, Tamworth Ex Services, University of Western Sydney, Crowne Plaza Darwin and many, many more. Call us today to see how we can enhance your function center.